Radio drama fans, rejoice! Music fans will also rejoice at this news. 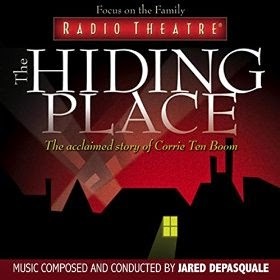 Earlier this week, the soundtrack for one of Focus on the Family Radio Theatre's best productions, "The Hiding Place", has made its way to the general public for the first time ever! Jared DePasquale composed several of the scores for Radio Theatre and for a few Adventures in Odyssey episodes as well. 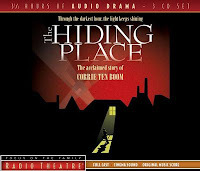 Fans are now able to hear the complete musical score that DePasquale composed for "The Hiding Place". The music in this production is, in my opinion, what makes this a truly outstanding piece of work. Jared DePasquale composed some of the most beautiful and heart wrenching music to go with this amazing true story. The music also has a great period vibe to fit the World War II setting. 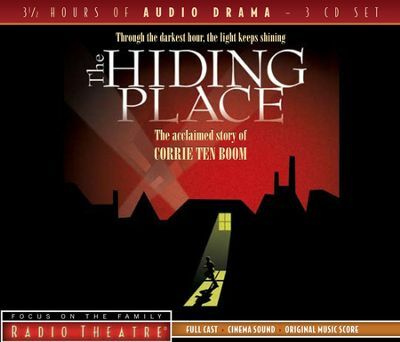 This marks the first time there has ever been a soundtrack available for a Radio Theatre drama. According to Executive Producer, Dave Arnold, if this product is well received, we could see the release of more soundtracks from other Radio Theatre productions. You can get a digital copy of the soundtrack on Amazon or iTunes. You can also purchase the audio drama production from Amazon and iTunes. What other soundtracks from other radio dramas would you like to see released? What Makes Dr. Regis Blackgaard A Good Villain?